Luisa Miller has never been at the top of anyone’s list of Verdi’s greatest operas. In the progress of the composer’s career, which brought it to life in 1849, it rests at the end of his early period, uneasily sitting between the much more lasting Macbeth and the real blockbusters of the early 1850s: Rigoletto, La traviata, and Il trovatore. Based on Schiller’s play Kabale und Liebe, its adaptation for Italian opera diminishes its Germanic intensity. Despite its scheming count and besotted duchess, the opera becomes a bourgeois drama replete with schmaltz, tedium, and longueurs – including that most typical of operatic clichés, an unnecessarily prolonged death scene. Its plot of star crossed lovers who end up dead by poison due to intervening family members and malicious sabotage follows the familiar trope of Romeo and Juliet a little too closely. The characters have long speeches about love, honor, guilt, and villainy, but their personalities go nowhere. The music is attractive but gives us none of the “greatest hits” from the roster of Verdi arias and ensembles. It is probably no surprise that the Met has not returned to the work for a dozen years, and its revival of Elijah Moshinsky’s densely representational production does little to make one wonder why. Seen at its well attended opening night on March 29, however, an almost unbelievably strong cast compensated for the work’s weaknesses. Sonya Yoncheva has moved from triumph to triumph since her surprise debut a few years ago. 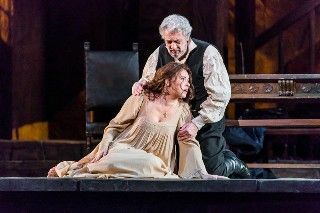 The role of Luisa Miller is not the most obvious dream for a rising soprano, but her clear, limpid voice carried it off with great distinction and gave great credibility to the character’s unaffected simplicity. Paired with the stalwart tenor Piotr Beczala, theirs was a formidable union that one cheered in its struggle to last against all obstacles. Beczala’s impressive delivery of the tenor showpiece “Quando le sere al placid” credits him with another triumph in the role of Rodolfo. The young Russian baritone Alexander Vinogradov made an excellent debut as Rodolfo’s father, Count Walter, who wants to marry off the lad to a rich widowed duchess. Olesya Petrova did what she could with that hapless woman’s role. Dmitry Belosselskiy gave a chillingly low portrayal of the count’s cowardly henchman Wurm. It was, however, the oldest member of the cast – superstar everything Plácido Domingo – whose casting demanded the most attention. Now 77, he shows no sign of slowing down. Indeed, as he continues on in the baritone repertory after his late career switch from tenor parts (one recalls that he sang and recorded an impressive Rodolfo as a younger man), he is even adding new roles. This was his first Miller, and his paternal charisma is unsurpassed among older baritones today. He does not, alas, possess the voice of a true Verdi baritone, but if one simply accepts that it is Plácido Domingo singing, this is an easy factor to overcome. We should be grateful for his decades of passionate commitment, and we can comfort our realization that this opera is a pallid riff on the Romeo and Juliet story with the knowledge that he will be back as Maestro Domingo to conduct Gounod’s more compelling operatic version of the tale later this season. With Domingo on stage, it fell to Bertrand de Billy to lead the performance. He approached Verdi’s score with a polished and penetrating intimacy, and nearly succeeded in making its more energetic moments compelling.